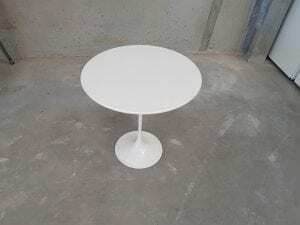 The Knoll Saarinen Tulip table was designed by the Finnish-American architect and industrial designer Eero Saarinen. Due to its timeless design, the table has acquired iconic status. The marble table top has a satin finish and features a bevelled edge for a smooth aesthetic; it is attached to the moulded cast aluminium base with a threaded rod. If you are unable to find exactly what you are looking for, we have an extensive range of other second hand tables in stock. Just click on the link provided, or simply enter your details into our ‘Request a Quote Online’ form below and one of our sales team will be in touch very soon. As always, this iconic table can be viewed in our showroom along with all our other used office furniture.